GREAT HEARTS OF AFRICA PASSION FRUIT PIRI PIRI SAUCE is fantastic as a dip for Biltong, and also the best dip for Samoosas! Delicious Marinade for sticky Ribs or Chicken wings: mix together half MILD RED CHILLI PEPPER SAUCE and PASSION FRUIT PIRI PIRI SAUCE, add some Rosemary and Salt & Pepper to taste. 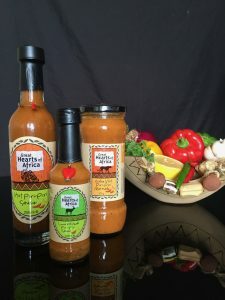 GREAT HEARTS OF AFRICA PASSION FRUIT PIRI PIRI is delicious poured over your favorite cream cheese (Philadelphia or Kiri for example) instead of Sweet Chilli Sauce. For a delicious Sauce for Steak Rolls, Veggie-Burgers, Hamburgers or Chicken Burger: mix mayonnaise with a few drops of GREAT HEARTS OF AFRICA HABANERO SAUCE for those who like a bit of heat, or LEMON & HERB PIRI PIRI PIRI SAUCE if you prefer a mild flavour. 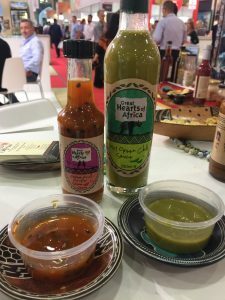 Add some GREAT HEARTS OF AFRICA MILD RED CHILLI PEPPER SAUCE, HOT GREEN CHILLI SAUCE or AFRICAN CHAKALAKA RELISH to your favourite pasta sauce, stew or curry and taste the difference ! Great Hearts of Africa conquers Iran!